Every now and then, more recently more often, the London Transport Museum organises tours deep underground. Only last month hundreds of tickets were snapped up for Aldwych (closed 1994), Charing Cross (closed 1999) and the Hidden London holy grail of Down Street (closed 1932). And if you were quick back in the spring you might have got tickets to a special space that was never a station, nor even intended to be so, namely the Clapham South Deep Level Shelter. 75 years ago this month, with the blitz at its height, the Government decided to build a series of deep level shelters beneath the capital. London Transport were the obvious partners, being experts in all things subterranean, and various stations on the Northern and Central lines were targeted for construction. Vague plans existed on these lines for express tube lines running parallel to the existing tunnels, their construction aborted by war, but at least LT had already undertaken the geological surveys. Each of the three Clapham stations would have been skipped by the express line, making them ideal for a twin-tube shelter, so the go-ahead was granted and completion took less than a year. But by this time the Blitz was over, so the facilities were mothballed and remained so until the first V1 bombs prompted their public opening. Clapham South admitted its first shelterers in July 1944. There were two entrances down deep shafts, one in the corner of Clapham Common and the other on Balham Hill, plus a staircase link to the station itself that was rarely used. What met them at the bottom, 36 metres down, were two long concrete tunnels filled with bunk bed after bunk bed. Cunningly each tunnel had been split into a top floor and a bottom floor, each subdivided into curving chambers the length of a football pitch. Each was named after a naval general, sixteen in total, ordered alphabetically from Anson to Hardy on top and Inglefield to Parry below. People were expected to carry in their own bedding, which meant lugging a mattress 180 steps down, and everyone had to be out by seven in the morning, which meant repeating this day after day. Clapham South had space for eight thousand people, though these numbers were rarely reached, and the authorities had to tempt Londoners down with free health care and off-ration treats. The entire set-up lasted less than a year before the war ended, and the trains never came, leaving these tunnels to a very different fate. The tour is damned good. It sets off not from the obvious shaft on the common but from a white-glazed drum beyond M&S Simply Food. A modern apartment block has been built above and around, whose residents were intrigued by the sudden intense interest being taken in their building, and appeared unaware of the secret space stashed away in their foundations. With feet checked for flat shoes and all cigarette lighters temporarily confiscated, we were off down fifteen spiral flights around a miniature lift shaft. Everything's mostly intact, this is no Down Street-style ruin, with full lighting throughout and no unexpected damp patches. Northern line trains sounded jarringly close, their passage rumbling regularly through the walls, but we were reassured that their tracks were at least ten metres above us. And many of the old wartime signs remain, perfectly hand-painted no less, which is just as well because a double decker twin bore cavern can get pretty disorienting pretty quickly. And blimey, this place is big. Led into one of the sixteen chambers it seemed to stretch on almost forever, but that was most probably the bend which mirrors the curve of the main road above. Many of the bunk beds remain, these little more than stacked boards on springs, originally longitudinal along one wall and perpendicular on the other. Some had canteens where twopenny teas and jam tarts were dispensed - such luxury - while all-too-brief passages at each end were designated for recreation on a Lilliputian scale. Also tucked away, in the occasional side-gallery, were a small medical centre and the all-important lavatories. 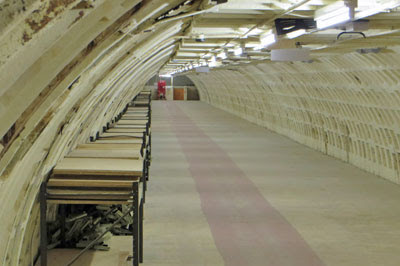 The most serious of these were chemical-based, requiring users to unload the contents of their bucket into a hopper at the end of the room for later evacuation, while what looked like a faint row of tube roundels along the wall was actually where the urinals were fixed. We had two guides, who alternated at each stop on the hour-long tour, and each was fully briefed and excellent. They knew how the control room had worked, and where to stop to see the best graffiti, and at precisely which point the iron rings of the tunnel skeleton switched to concrete (for speed of construction, and availability of resources). Commentaries were informative and animated, and never felt rushed, which is precisely what you need on a whistle-stop underground trek. The guides' favourite phrase was 'witness marks', which I must confess I've never come across before, but relates to evidence from back then that's survived to the present day. In this case a lot of the original fittings have been swept away by subsequent use, but details like a power socket in the infirmary and the colour-coded painting of dormitory poles helped make the connection to the building's wartime heritage. A really nice touch were the photos and information boards, the former often blown up to full size and located in precisely the same place they'd been taken seven decades previously. 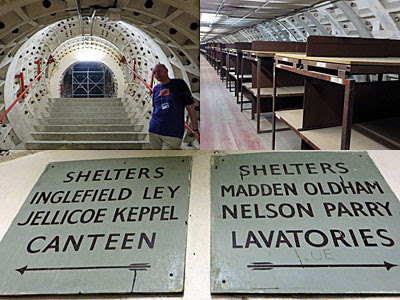 Perhaps most impressively the tour managed to tell the story of the shelters chronologically, whilst leading us on one floor or the other through the entire complex. After a detailed wartime trawl we then considered what came next, as the Government tried to work out what to do with thousands of underground beds. They tried creating a penny hotel for the austerity tripper, and (most famously) in 1948 they housed the Empire Windrush arrivals on their first nights in the mother country. The closest Labour Exchange to Clapham South was in Brixton, so these Jamaican immigrants found jobs and made their homes nearby, and through this quirk of administrative geography changed the ethnic spread of south London forever. Health and safety meant hostel use soon became impossible, and in the 1960s the tunnels were instead given over to the storage of materials. Government archive boxes filled the passages, those thousands of bunk beds becoming ideal sets of shelving, and later a private company took over instead. 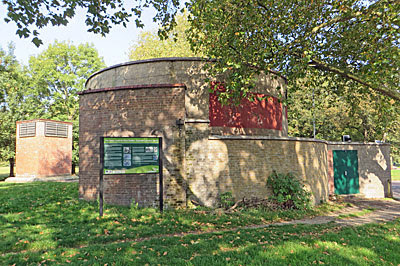 But they pulled out in 2008, and since then the Clapham South shelters have been sitting around in need of a purpose. The London Transport Museum hope that public tours might be an occasional solution. The need to walk up 180 steps to get out is certainly a drawback, as some of the less fit members of our tour party discovered. Meanwhile one of Clapham's other deep level shelters - that's Common, not South - has been taken over by a hydroponics company for the growing of micro-salad destined for high end restaurants. It may not be the express version of the Northern line that London Transport once proposed, but it just goes to show that in London you never really know precisely what's lurking beneath your feet. Unless you get tickets next time, that is.